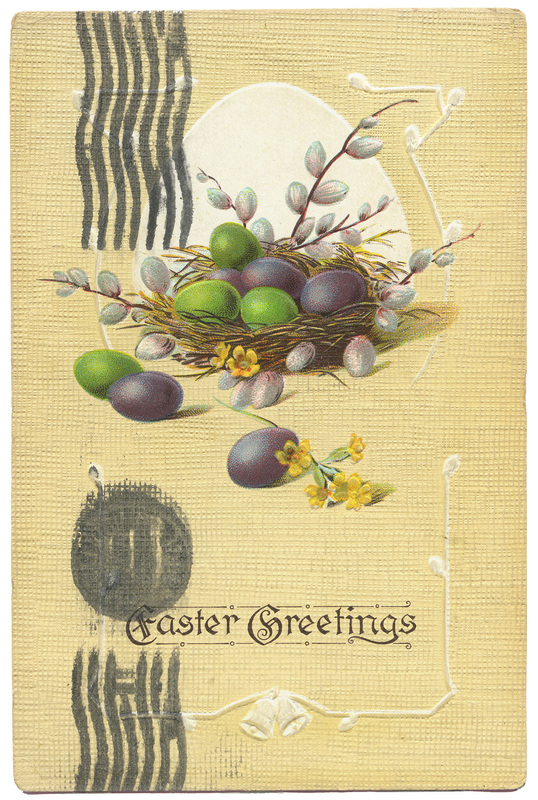 At Easter-tide I’m dipping once again into my Grandma Fannie Martin Longenecker’s stash of vintage post cards. 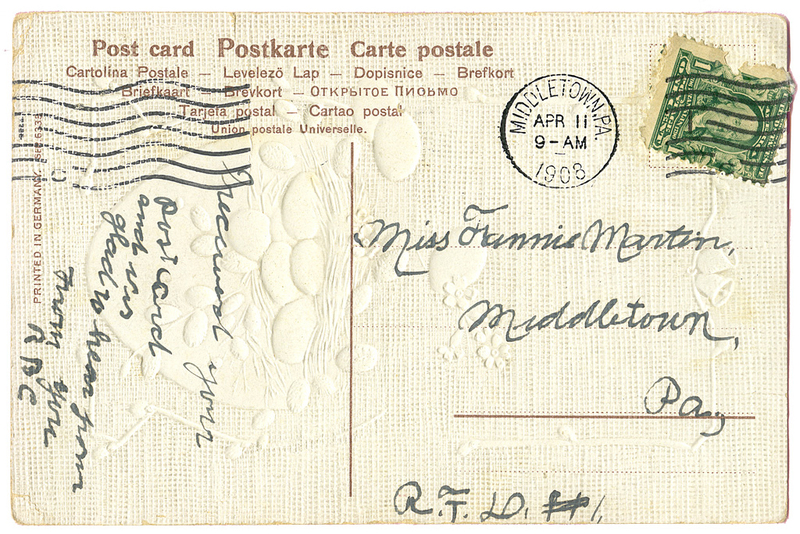 Here is one dated April 1908 from “your RBC,” it says, with the postmark wrapped around the face of the card. 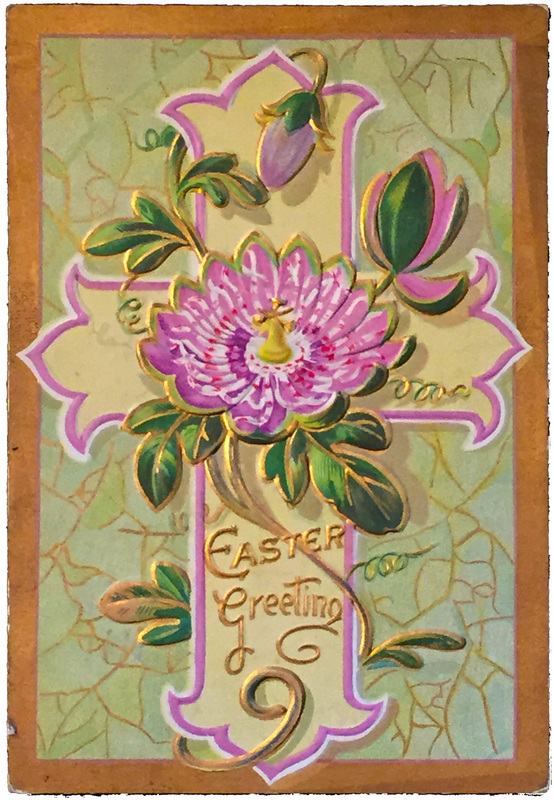 Another, from 1910, displays the marvelous passion flower adorning the cross. 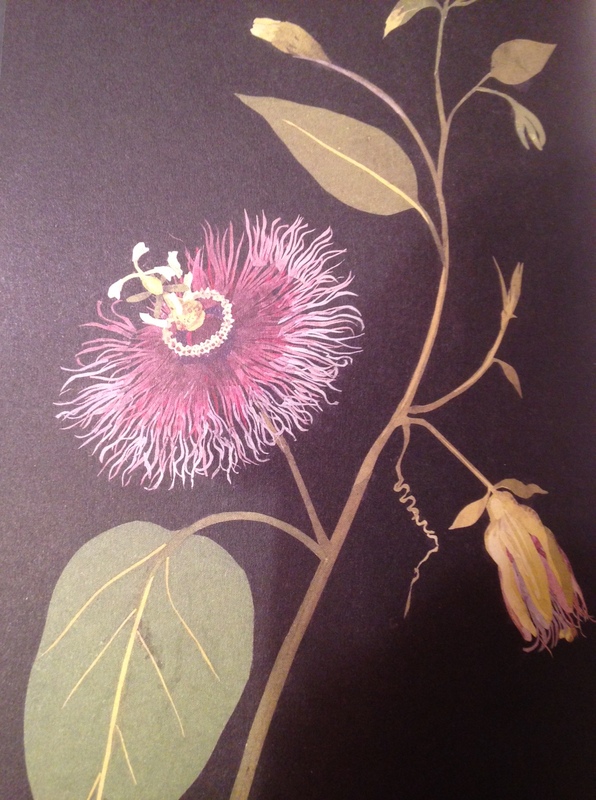 The passion flower which blooms in the spring has come to symbolize the suffering and death of Christ, hence the nickname “passion.” Mary Delany, herself a late-blooming artist, constructed a lovely flower with 230 petals with her scissors art. The bloom (Passiflora) grown in my garden illustrates the religious symbolism explained below. One writer, a Franciscan sister, has expressed the meaning of the flower parts in this way. * The blue [purple] and white colours of many species’ flowers represent Heaven and Purity. This is the season of spring, Easter, and Passover. Happy Holy-day to you! I love this, Marian! This is exactly the reason we need to cut down on e-mail and send handwritten cards, letters and postcards. I found some usable postcards from my mother’s stash when we cleared out her house. When I remember, I can use them for special notes to friends and relatives. Miranda Beverly-Whittemore, a best-selling author who has just recently come out with her second novel, June, swears by using hand-written notes in correspondence with people in the publishing world. I guess it takes them by surprise because it is so unexpected. Thanks for your kind words – Happy Easter, Jill. Happy Easter to you too, Marian. Thank you for sharing your passion flowers and your passion with your readers, Marian. Happy Holy Week and Easter to you. As you know, WP posts can be put into a queue long before they go live. My plane was delayed in Philly yesterday, so today will be a day of quiet renewal, getting my strength back. Maybe passion will emerge tomorrow. 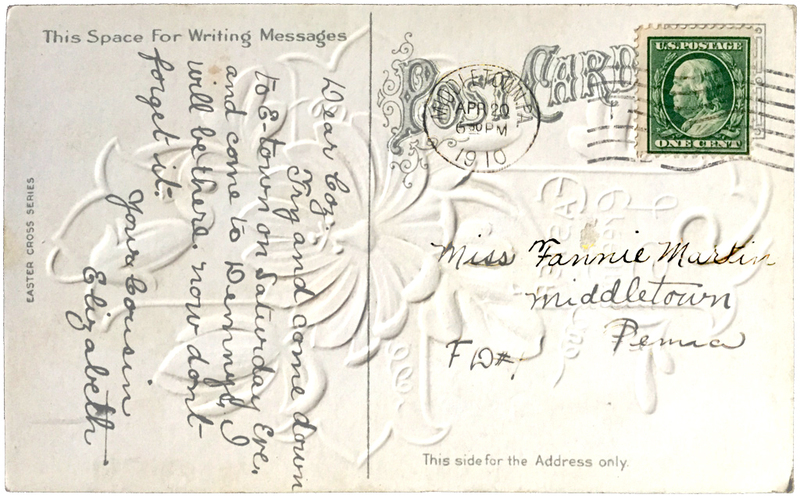 Most old postcards needed only a name and city/state because the postman knew everyone in town! She should have sent it to you c/o General Delivery. We used to do that when someone was travelling before days of cells phones (and call boxes were too costly for long distance). Then the person just picks up their correspondence at the main post office. It helps to know that you are expecting mail/ or sending, whichever. Happy Easter to you and your family. I hope you will be together. Possibly my mother didn’t and that’s why her letter didn’t make it. Yes, we have plans for an Easter dinner. We have been scattered for a few weeks now, so it will be nice to be together. What to cull and what to keep, that is the dilemma. Maybe keep some from each season or choose a few from special relatives. Some museums welcome artifacts of this sort The problem is – it’s simply hard to let them go. I so enjoyed meeting you this week and value highly your input on my work. I have a feeling our paths will cross again. Happy Easter to you and your family too. Thank you for the lesson on the passion flower, which I knew nothing about. Your gravatar photo has greatly expanded, Merril. I can now see a three-dimensional friend sitting at Janet’s table warmed by the sunrise on Chincoteague – with coffee! The passion flower symbolism is intriguing. I’m glad you enjoyed it! Oh my goodness, I love your response. We are now definitely three-dimensional friends! Safe travels on your path to France! How interesting! They say we learn something new every day so I guess learning about the Passion flower is my lesson for today! And now I’m going to get my old postcards, from my great-aunts, to see what I can find! Thanks again for a stimulating post. Have a very happy Easter! I’d love to see your old postcards too. Maybe you can post them on a blog sometime. Your girls may enjoy seeing them too. They may even want some. Crista has a New Year’s card from her Grandma. I’m certainly in the passing-down-to-the-next-generation mode of thinking; I hope she wants some more. I picture you sifting through stuff, as I’ve been doing. Be prepared to be surprised! Thanks, Anita. I love the cousin’s reminder “now don’t forget it.” There’s probably a lot of history behind that familial reminder. Cards from over a century ago are indeed a treasure, interesting to share. You just can’t say “now don’t forget it” as effectively in a text, can you? I’ve pondered what was behind those words. Was my Grandma Fannie forgetful? Elizabeth, a needy person? I guess we can only surmise. Think of the anticipation (and maybe suspense) waiting for a reply that would take days. Happy Easter, Melodie. A perfect Easter post Marian! I love the old postcards, so precious. 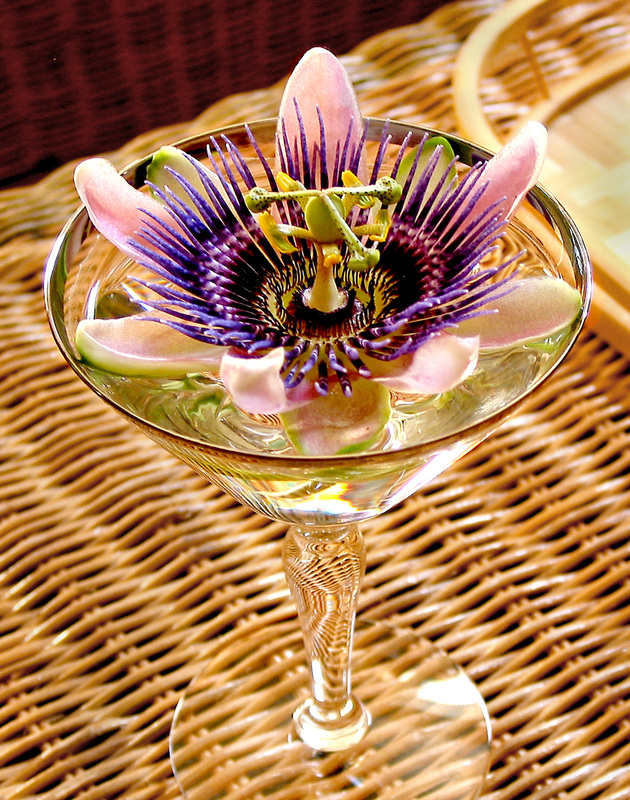 The explanation of the passion flower is one I hadn´t heard before, thanks. I wish you and your wonderful family a meaningful Easter. I just read your post for Wednesday, and mentioned what crafty thing we might be doing with the grandkids.. Can I look forward to a post about Easter in Spain? Wow what a beautiful flower and the significance of it. I need to find this for my garden. This coming week I planned doing break for my grandchildren without noticing it was Easter Sunday, I made plans to take the kids to San Diego CA to visit Point Loma University where Imani wants to study. I never miss church especially Easter Sunday. All plans are in place and can’t be changed. We’re taking advantage of trip stopping in Grand Canyon staying the night there before going to San Diego. Then to cousins in Salida, CA. Then San Francisco. On the way home Prescott, Arizona to friends from church to stay the night with them. Long full and tiring but great time and memories. Of course you can observe Easter Day anywhere. The GrandCanyon would be an awesome place to worship. I’m happy to hear of Imani’s plans for study in San Diego. Easter comes early this year which is one reason you may have been caught unaware. Safe travels to you and the whole caboot, as Mom used to say! Marian — What a beautiful passion flower! And to know that it came from your own garden astounds me. It so exotic, it looks like it would be found on a tropical island. I enjoyed learning about its parts as they relate to Christ and the crucifixion. I didn’t receive chicken scratch, Laurie. The printing was elegant and the lines straight as an arrow. How did you do that? I’m so excited to see your dream unfold one step at a time this year as prepare to launch. Enjoy the season! Thank you Marian for sharing your passion through these treasured postcards and your beautiful words. Wishing and yours a blessed Holy Week and Easter. May you and your family enjoy all the events of Holy Week! Oh, and thank for sharing on Twitter. O that is such a lovely story and photo of the Passiflora Marian thank you! The religious meaning is profound. I will come back to this I know – I did not know before about the symbolism. And how lovely is the ‘old’ postcard! A blessed Easter to you and family. I’m most happy to pass on the flora symbolism. I’ll never look at passion flower blooms the same. After you’ve seen the flower, the explanation makes so much sense. Enjoy this season, which I assume is autumn where you are. I hope you’ve taken a breather too after the wedding. What beautiful treasures. Thank you for sharing and showing your exquisite flower. So many delicate components – a photographer’s dream! A Blessed Easter to you and your family! Like the artisans who made rose windows in medieval cathedrals, these postcards artists weren’t interested in quantity. God’s creation is beyond awesome too. I’m showing the exquisite passion flower. But think of the peacock, and the ______! Time appeared to move slower. People seemed more civil then – at least from my perspective more than 100 years later. Happy Easter to you, Debby. Marian, I remember looking through my grandmother’s stored postcards and letters, amazed that just her name and the name of the town was enough to have them delivered. A more simple time, indeed. This is a lovely post. Thank you, and Easter blessings. I would imagine the style of art would be similar to what you see here, but with a Kansas postmark, just guessing on the state. I’m glad you enjoyed the post and said so here. Enjoy Easter with your family, Marylin. I love how light reflects, refracts and sets a mood for objects. When trying to bring out the richness and bas relief on some of these postcards I actually tilted the card so light would catch part of the card I wanted to emphasize and then adjust the distortion of the card–back to its normal view. Marian keeps up with growing her flowers and sharing their names…I just admire them and sometimes take a photo of them, such as this passion flower. The different parts of a passion flower are certainly a visual sermon in itself, especially thinking of this Easter season. Thank you! I believe you may be celebrating Easter in England. Happy holiday wherever you spent it, Lady Fi. Grandma Fannie Martin Longnecker ( I do hope I have the lettering right) are you sure that didn’t come straight from the pages of Dickens ? 😌Such an amazing name. I had no idea of the significance of the Passion Flower Wow thank you for that . We probably won’t have hot cross buns, but I’m guessing dinner rolls – something with butter for sure. Enjoy Easter however you celebrate it, Cherry. You too, Marje. Thanks for stopping by! Ah, dear 100-year-old mother-in-law Virginia. In your Italian greeting to her I detect a reference to the Paschal lamb, which for me evokes images of innocence, sacrifice, and atonement in the Jewish and Christian traditions, maybe others. Buona Pasqua to you too, Elaine. But you are writing and walking – good for you! I don’t know how you do it all – with a full time job too.